St Leonards Sixth Former Nerea Gomez-Martin (Year 12) has been awarded third prize in the prestigious Scottish Schools Art Exhibition at The Caledonian Club in London, at which the works were judged by renowned Scottish artist John Lowrie Morrison OBE. Contemporary landscape painter Jolomo selected Nerea’s submission from a high calibre of entries from schools across Scotland. She created the striking piece, entitled ‘Winter Morning’, in Year 10 as part of the GCSE Art course at St Leonards. 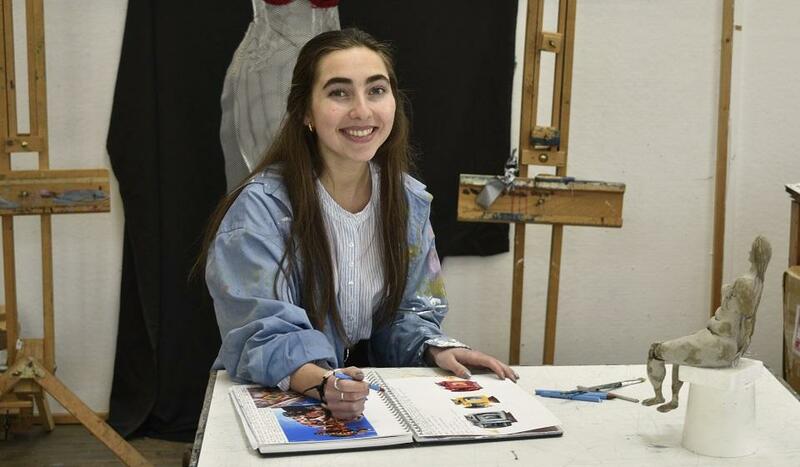 Now in the Sixth Form, Nerea is studying Visual Arts as part of the International Baccalaureate Diploma programme. Inspired by a family walk by the edge of a loch, Nerea used photographs to create a painting of the scene, incorporating a range of techniques including stippling and mixing water with acrylics to depict the swirling tree branches. Also featured at the show was an impressive submission from Year 11 student Ka Yan Luk, who used an experimental technique with newspaper, white emulsion and coffee to create a drawing of a skull, finally working over the top of the base with charcoal pencil while still wet. The Scottish Schools Art Exhibition ran from Monday, 25 February to Friday, 22 March in the Drawing Room of The Caledonian Club, Belgravia.